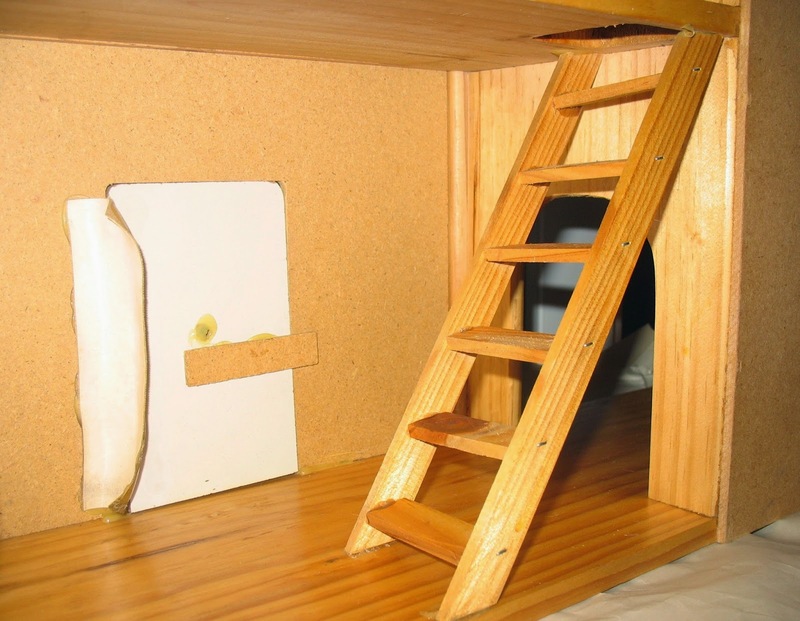 Rebecca's Collections: A Lumberjack dolls house? I've been spending this week in Bathurst, with my sister. Sunday was the third anniversary of our mother's death, and we like to be together on that day and on her birthday. This time, I flew down from Darwin and hired a car in Sydney to drive to Bathurst. Usually I get the train, but hiring a car meant I could meet up with my aunt in Sydney, and also collect two dolls houses in Sydney suburbs along the way. It's 72.5 cm (28 1/2") wide (at the base) by 19 cm (7 1/2") deep. 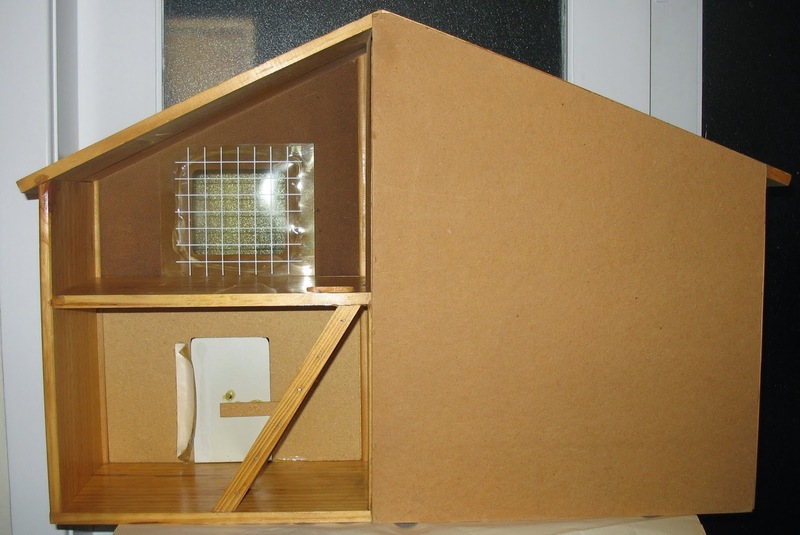 The lower rooms are 20.5 cm (8 1/8") high, and the front door is just under 15 cm (6") high by just over 9 cm (3 3/4") wide. The design of the door and the brickwork are the same, they both have shutters, although they are a different colour, and the same plastic windows are used. I think they are probably made by the same manufacturer. I wrote last year that I had found entries in recent business directories for Lumberjack-Bestoys, in Engadine, a suburb of Sydney, so there may be a link to Bestoys. I wasn't sure of the date of the Geoff Emerton 'Toyworld' catalogue I found it in, but thought it was probably from the late 1970s or the early 1980s. 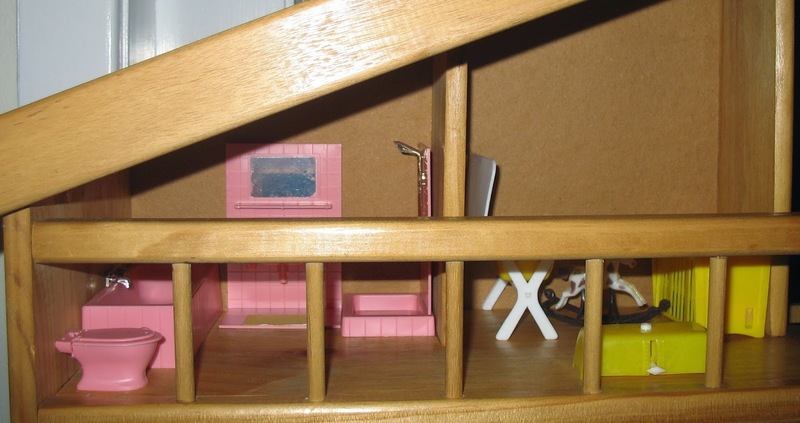 With this dolls house, I can say that it probably dates from the 1980s at the earliest, as the front door is made from MDF, large-scale production of which began in the 1980s. I think the door was originally attached by that bit of fabric which has come unstuck. I'm not sure if the bit of wood, forming a kind of latch, is original, although it may have been meant to stop the door swinging forward through the opening. A bag of plastic furniture came with the house. 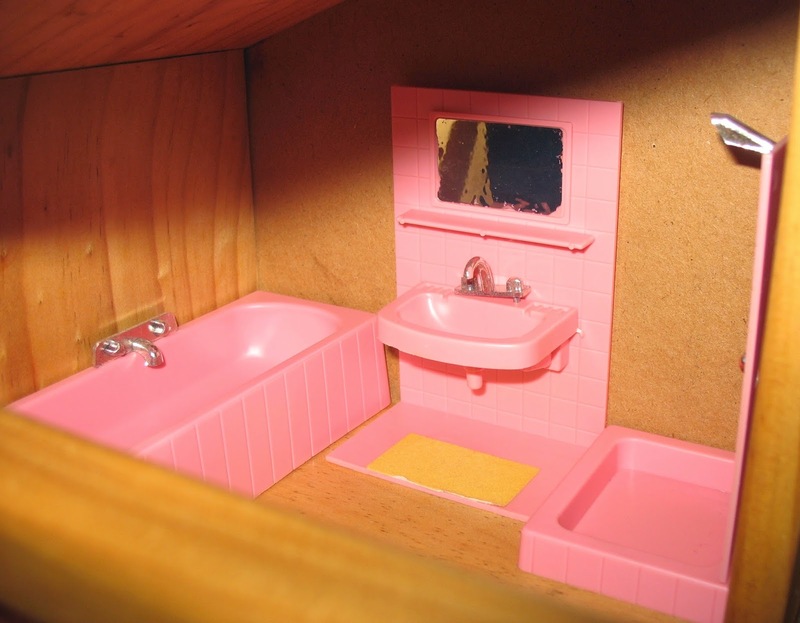 Most of it is Linda from Hong Kong, the bathroom is Jean of West Germany, and some is unmarked. 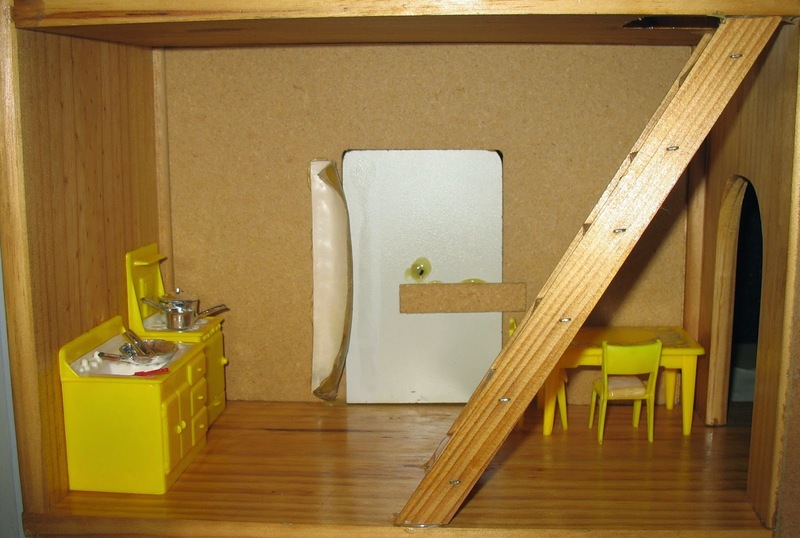 The kitchen furnishings consist of a bright yellow sink and stove, with a table and chairs. Only the chairs are marked (Made in Hong Kong). 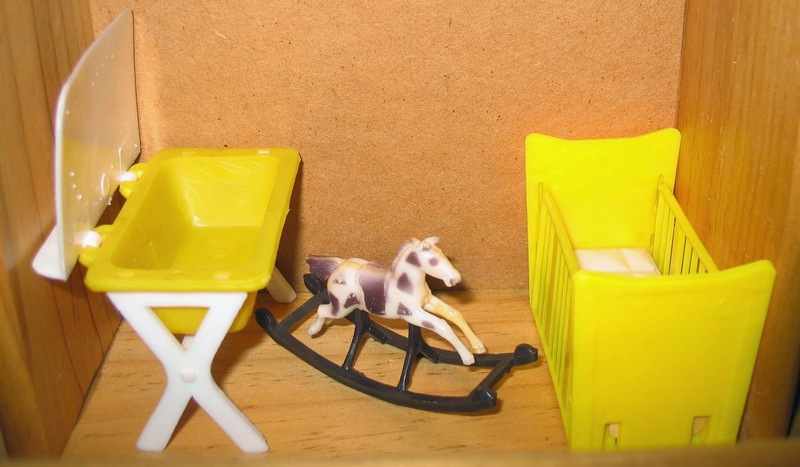 Most of these pieces are not marked at all - I recognise them from the Linda boxes I have (although the bedroom set on my boxes is shown in pink and red). So it's possible that the unmarked kitchen pieces are also made by Linda, but they are not the kitchen set shown on the boxes. 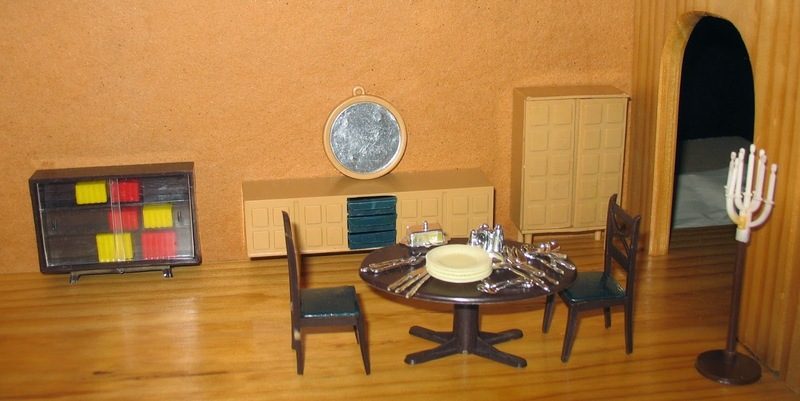 - or at least I recognise the dining table and the sideboard from the sets and boxes I have. The chairs are a different design - they are marked Made in Hong Kong, but whether they are from Linda or another brand, I'm not sure. 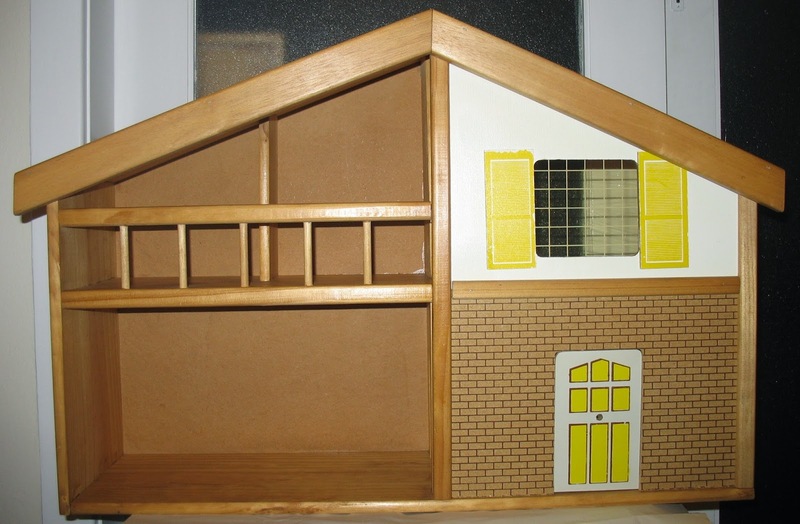 I'm not sure who made the bookcase, either - I have one sold by Fairylite, but it doesn't have the sliding doors. Unless I find these pieces in a boxed set, I probably won't know! I like the bright yellow, green and pink furniture against the pine (and MDF!) walls of this house. There's no living room furniture, so I may bring my red Linda living room pieces down from Darwin. I wonder which dolls lived here? 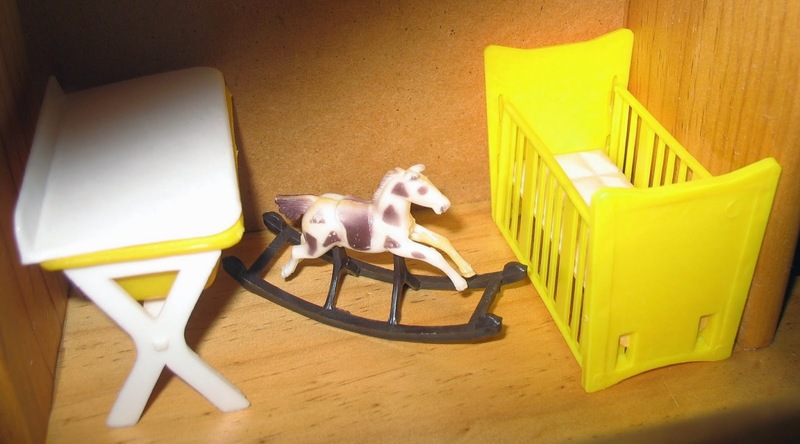 Probably they would have been plastic, like all the furniture, so perhaps I'll look for some 1980s plastic dolls who need a home. Thanks again, Julie. 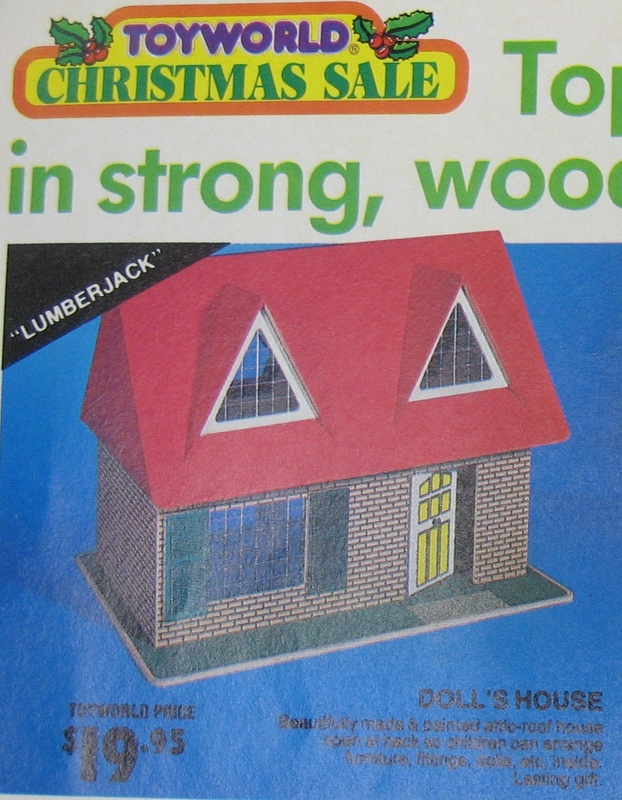 It sounds like your family would have sold Lumberjack Toys before Lumberjack bought Bestoys at the end of 1984? I haven't yet got to the 1980s in looking through the toy trade magazine - hopefully that will have more information too.